On Saturday, my mom and I went to Philadelphia for the day. Our main destination was the Mütter Museum, but it was her first time in Philly so I wanted to show her some of the historic sites as well. The line for the Liberty Bell was around the block—pro-tip: you can see it through a side window without waiting—so we headed to the nearby Christ Church burial grounds. I'd been once, on my first trip to Philadelphia in 2014, but I never say no to a repeat spin around a historic graveyard. 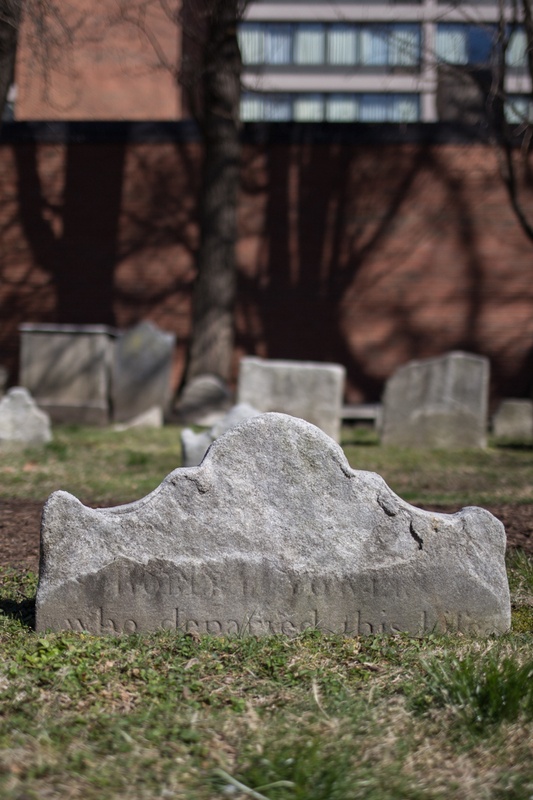 Christ Church burial ground was established in 1719 and is now the final resting place for more than 4,000 people. Notable burials including five signers of the Declaration of the Independence, medical pioneers, military heroes and victims of a Yellow Fever epidemic. The most famous of those signers is Benjamin Franklin, who is buried alongside his wife and daughter. 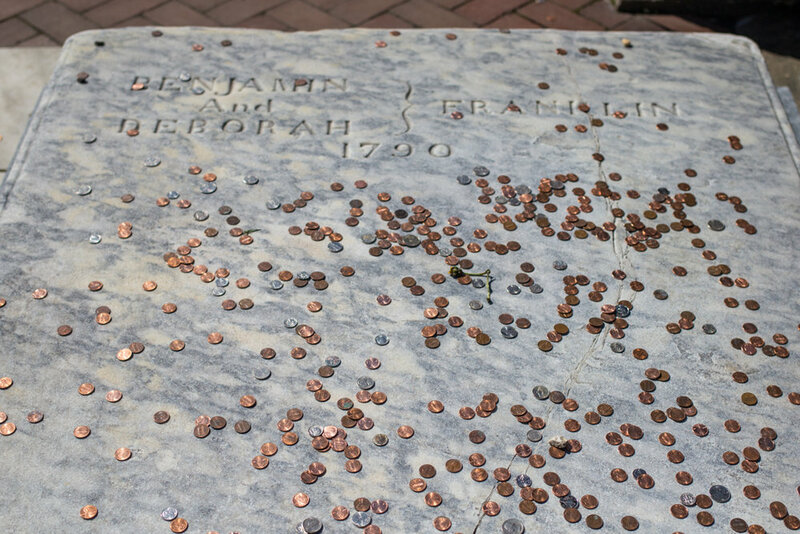 Visitors throw coins on his grave because of the phrase "a penny saved is a penny earned," which is attributed to Franklin. 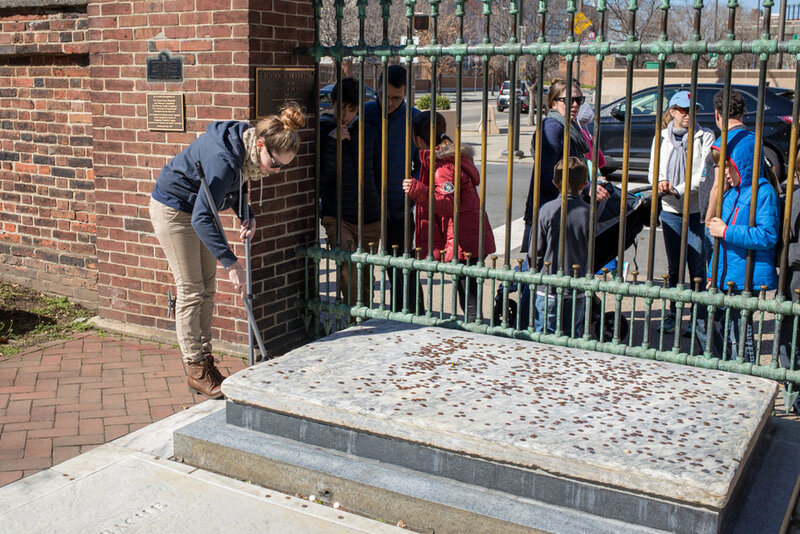 $5,000 a year is earned from the daily collections (they sweep them into a dustpan) and the money is used for cemetery maintenance and restoration. Christ Church burial ground is still the only cemetery I've had to pay admission to enter, and the cost increased from $2 to $3 since my first visit. 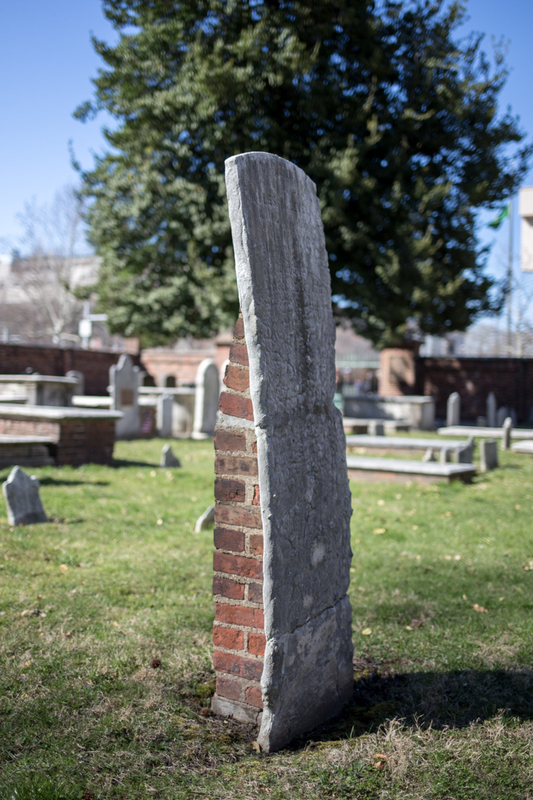 In 1858, an opening was placed in the brick wall at the request of Franklin’s descendants so his grave could be viewed by the public at any time. I think the admission price also keeps the cemetery relatively empty, which is probably good for preservation efforts and is great for me to take photos in peace. 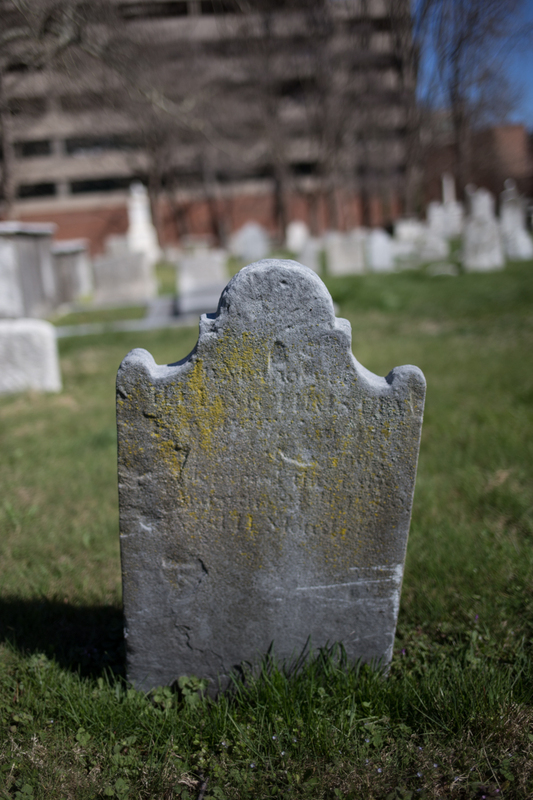 The burial ground currently has 1,400 markers, and another 2,500 have disappeared over time. A lot of the stones are so worn that you can no longer read the inscriptions, but you can purchase a map for a $1 that points out notable graves. Luckily, records were kept and a lot of the stones have new plaques that explain their original inscriptions. My favorite stone was the one that my mom pointed out, above, that looks just as sad as you would expect a lonely, 18th-century tombstone to be.